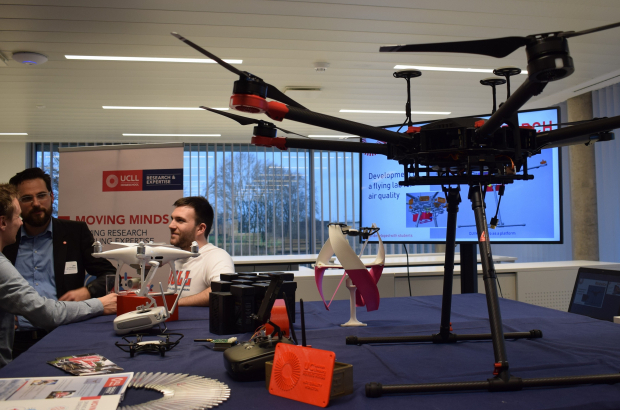 At Brustem, a former military airbase in Sint-Truiden, the unique DronePort centre recently opened its doors to organisations involved in the drone sector. A prestigious consortium of enterprises, including world-leading e-commerce group Amazon, has already chose DronePort to carry out a key European pilot project. The buzz around drones has grown deafening in recent years. The unmanned aerial vehicles can used for innumerable commercial activities: package delivery, agricultural spraying, inspections on construction sites, police monitoring operations, assessing situations for firefighters… the list is endless. But many of these applications still have to move from the test phase to real-life. DronePort’s ambition to facilitate this transition. “Our strength is that we combine manned and unmanned air traffic on our grounds,” says general director Mark Vanlook. Apart from drones, the airbase also caters to a limited number of light aircraft, providing excellent conditions to test the realistic use of drones in airspace and to train drone pilots. DronePort offers testing and training facilities, with zones of 12 kilometres long and seven kilometres wide, where – more importantly – drones can fly up to 650 meters from the ground. “Normally, drones are only allowed up to 90 meters, so that makes a huge difference,” explains Vanlook. Through a ministerial decree, federal mobility minister François Bellot awarded DronePort this exceptional status. The drones can also fly there at night, which is illegal in Belgium otherwise. These special conditions and specially developed facilities have convinced 25 companies and knowledge centres to establish themselves at the offices of the DronePort campus. There is also an incubator for start-up companies, which can profit from the interaction with larger companies and knowledge centres. Among the on-site businesses are drone equipment producer Airobot and drone pilot training enterprise DroneCollege. Among the knowledge institutions are PXL University College in Hasselt and Flanders Make, the region’s strategic research centre for the manufacturing industry. By this summer, some 100 people will be working at DronePort, which has capacity for about 250 people. DronePort is an initiative of the Limburg investment company LRM, the city of Sint-Truiden, economic development agency Pom Limburg and private partner JK Invest. The total investment amounts to €16 million. The ambitious drone hub should boost the economy of Limburg, which is gradually recovering after the closure of the Ford factory in Genk four years ago. DronePort certainly got off to a flying start, chosen at the test grounds for a project of the prestigious Safir consortium. Safir is short for Safe and Flexible Integration of Initial U-space Services in a Real Environment, with U-space referring to drone activities at altitudes of up to 150 metres. Among the Safir members is global giant Amazon but also Belgian forerunners such as telecoms company Proximus. The EU is providing funding for this unique test project. Euka also works on harmonising the legislative frameworks around drones in the EU. The project by the Safir consortium can help to determine what form European regulations could take.